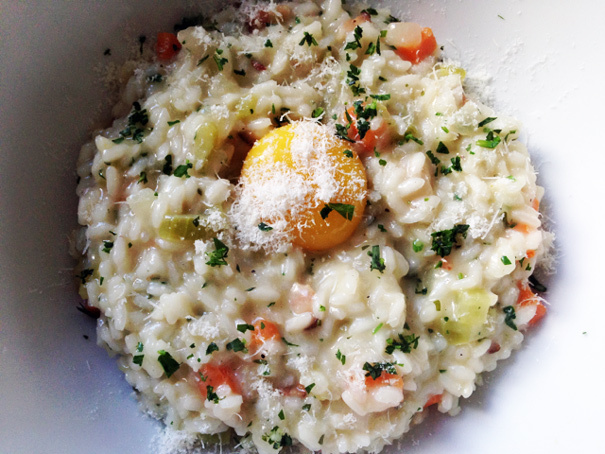 Is there any dish with more rules attached to it than risotto? Watch any episode of Top Chef where someone tries to make it, and you’re bound to see someone packing their knives and going home. 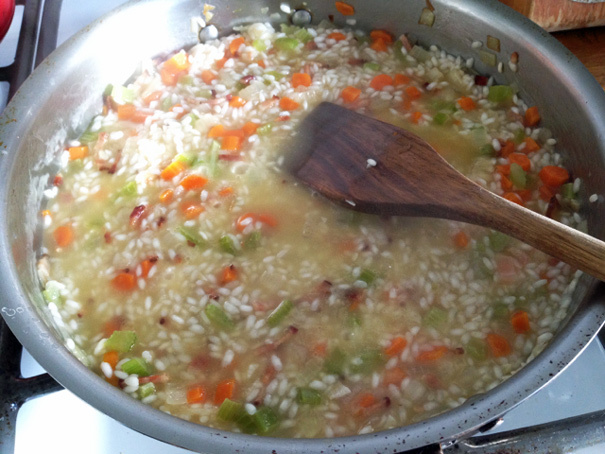 There are rules about the kind of rice you use (Arborio vs. Carnaroli), what kind of stock you use (dark stock, light stock) and the consistency it should have when it’s done (toothsome? pliant? mushy?). 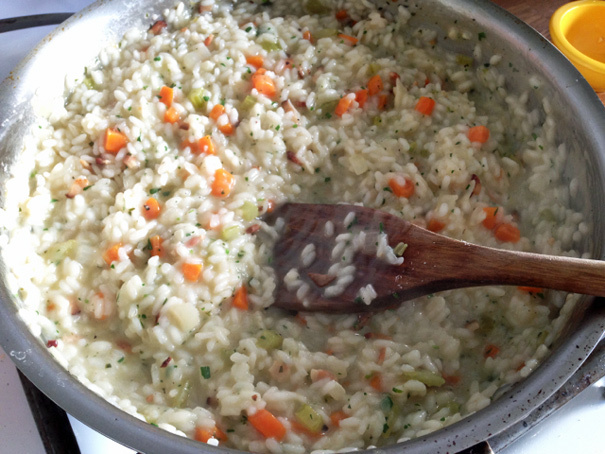 These rules matter if you’re cooking on television, but at home these rules go out the window: I’m here to tell you that risotto is a cinch to make–you can even make it with water! (something I learned watching Lidia Bastianich)–and, best of all, you can make a really good one, with bacon and egg and cheese, for breakfast. 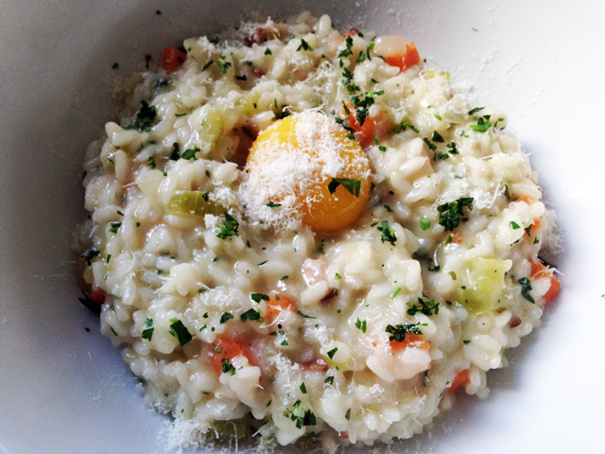 Risotto for breakfast? Hey it totally works. Watch how easy. 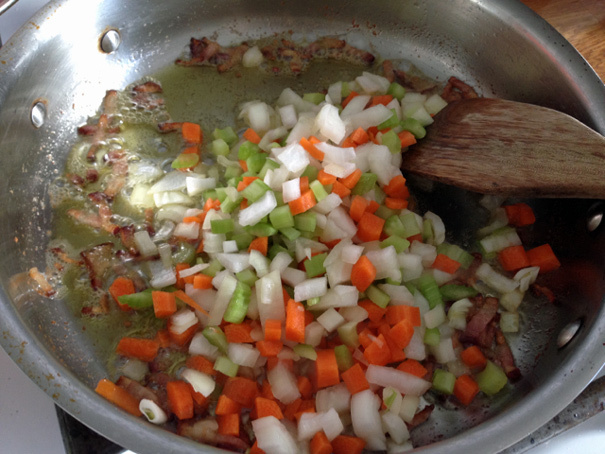 Turn up the heat and when the bacon has rendered a lot of its fat, but isn’t quite crispy yet, add your sofrito: chopped onions, carrots and celery with a pinch of salt. 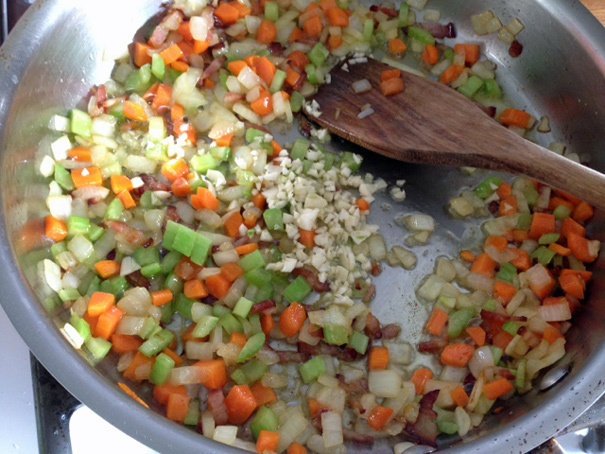 When those have softened a bit, five minutes or so, add 2 cloves of minced garlic. 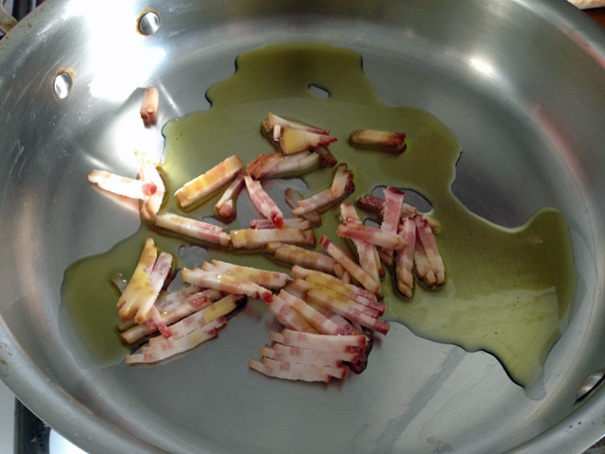 Then add a big splash of white wine; use whatever’s leftover in your fridge. 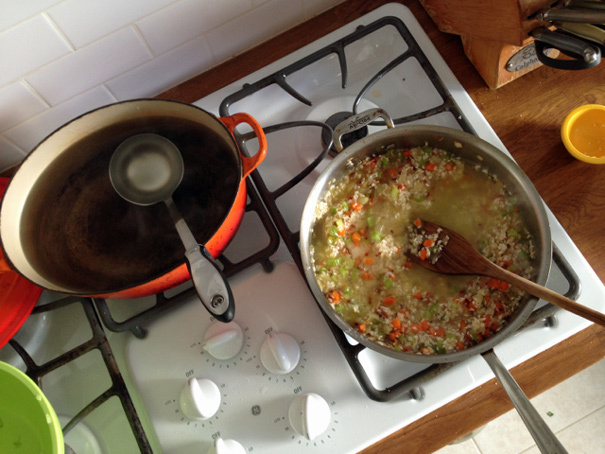 When that cooks off, begin ladling in your hot semi-salty water (you don’t want the water too salty, or you’ll have salty risotto). 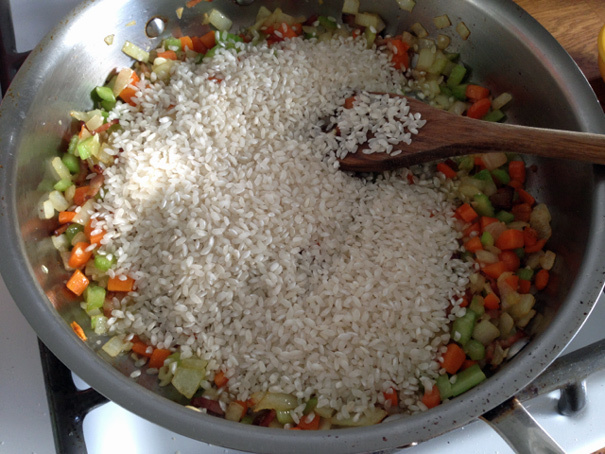 Keep the rice covered with liquid and make sure the temperature in the rice pan allows there to be some bubbles without crazy active bubbles. 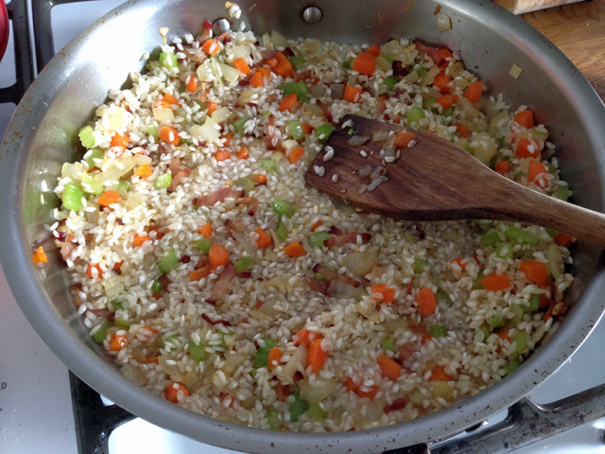 You want the rice to cook in 20 minutes. Spoon it into bowls and, to take it over the top (and I’m always doing that) nestle an egg yolk into the center of each, topping with more parsley and cheese. At the table, you can stir that yolk in and it’ll cook in the residual heat of the rice (and make everything even more rich). 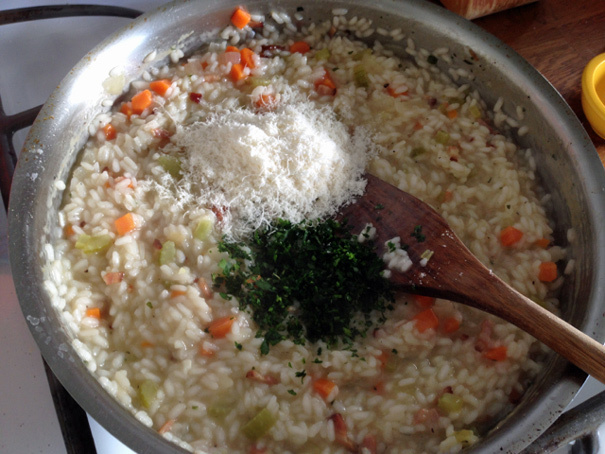 Risotto for breakfast. Who knew? I did! And now you do too.